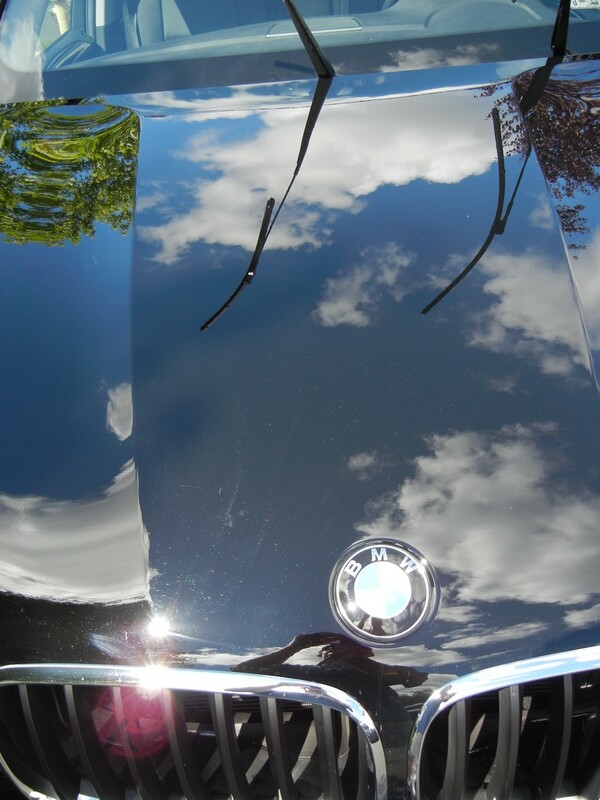 A summer kickoff classic is the summer waxing of the cars at Tarn Aeluin! Early June is the best time to do it. 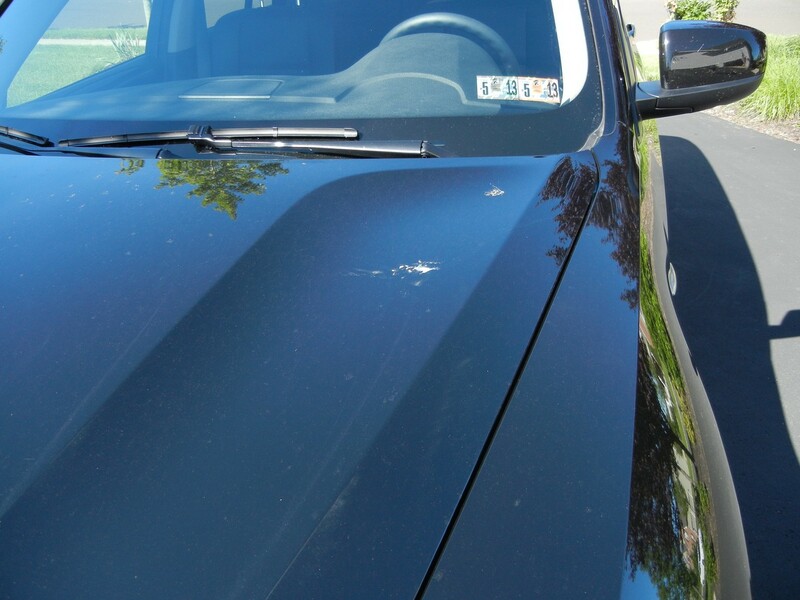 You can get off the super juice spring bug guts before they are petrified and permanently glued to your car, but its also not blazing hot outside. This is becoming an annual birthday treat for me – all day in the garage with some coffee (quickly transitioning to beer), tunes, and fresh carnauba. What could be better? Luthien is taking me to lunch at Issac Newton’s during Philly beer week so that means quite a bit including Ballast Point’s beers (all of them) on tap. Big Eye IPA is on my list to try. Oh yeah this was about cars. 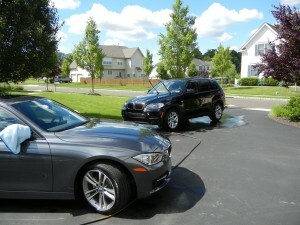 On tap today will be a wash and detail on both cars (2011 X5 and a 2012 328i). 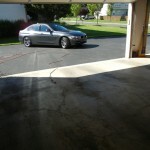 The 328i is brand new and I just waxed it a couple of weeks ago. The X5 however is flithy – bad Luthien! 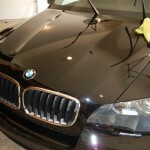 – and will also get a full clay bar and double waxing. 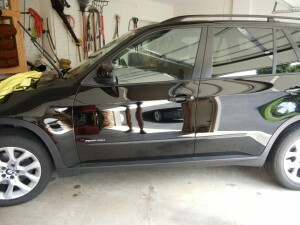 The first wax will be Meguiar’s Cleaner Wax and the second will be Pinnacle Souveran Carnauba – the best wax there is. Come on guys – this is like surgery. You need the right tools, the right space, and of course time and practice to get the results you want. Starting out with the right goods is key. 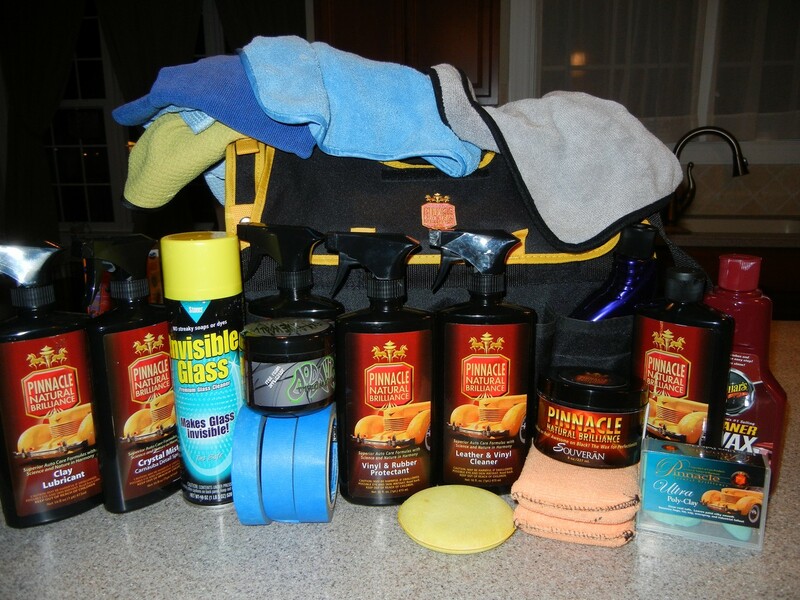 I focus on a lot of Pinnacle products with a few extras from Meguiars. 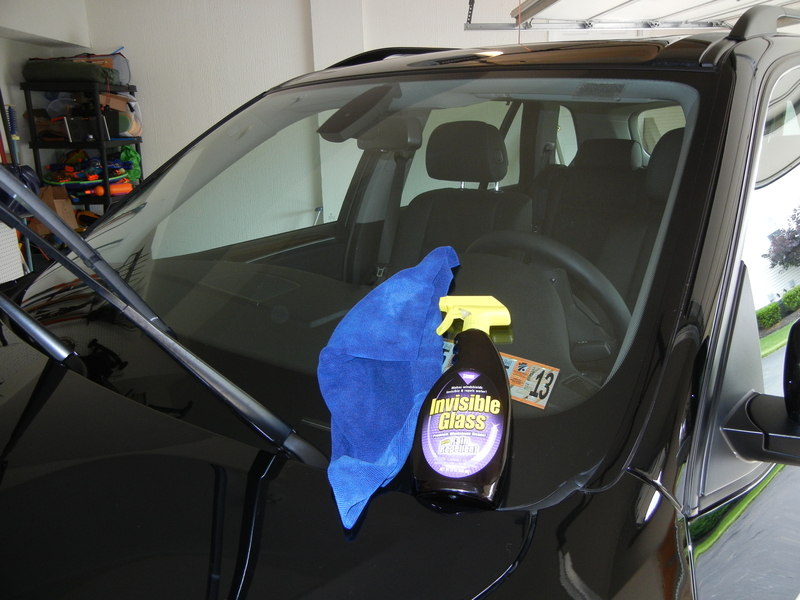 I use two kinds of invisible glass – the rain repellent stuff outside and the regular stuff on the inside. For towels I use a lot of Cobra towels from AutoGeek.net. 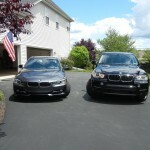 I’m going to use Pinnacle’s clay bar kit. 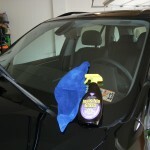 Meguiar’s Cleaner wax will back that up to help try and get off any lingering bug guts and really sticky stuff. I’ll also try (carefully) Pinnacle’s Bodywork Lotion. Well I might or might not – only if I think I need to. just rubbing anything on the paint concerns me. 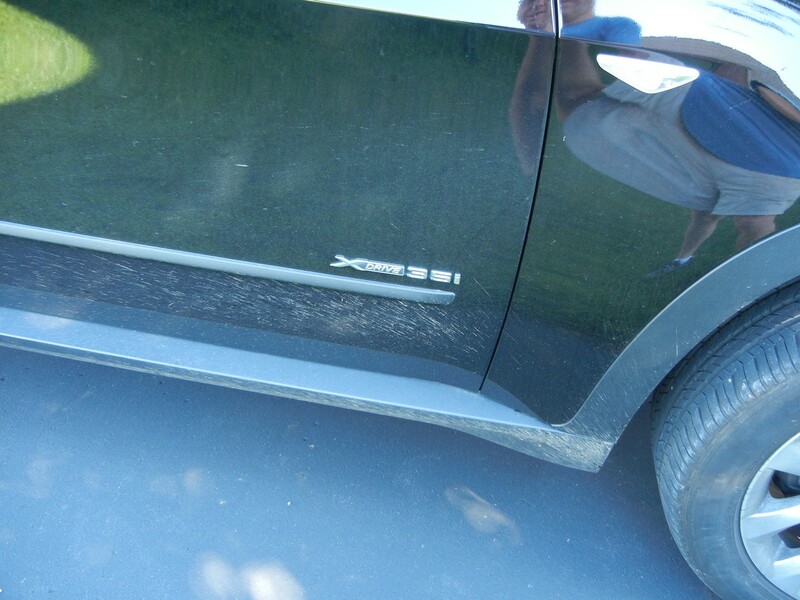 there’s a couple of nasty scratches on the X5 so I will be using Meguiar’s X2 scratch remover. We’ll see how that goes. The second part of prep work is of course the operating room. 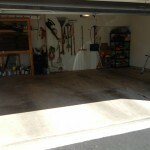 Before you start – clean the garage. Walking around kicking up dust while you are waxing is not good. My technique is simple. Throw out or put away anything that can be moved by a leaf blower. 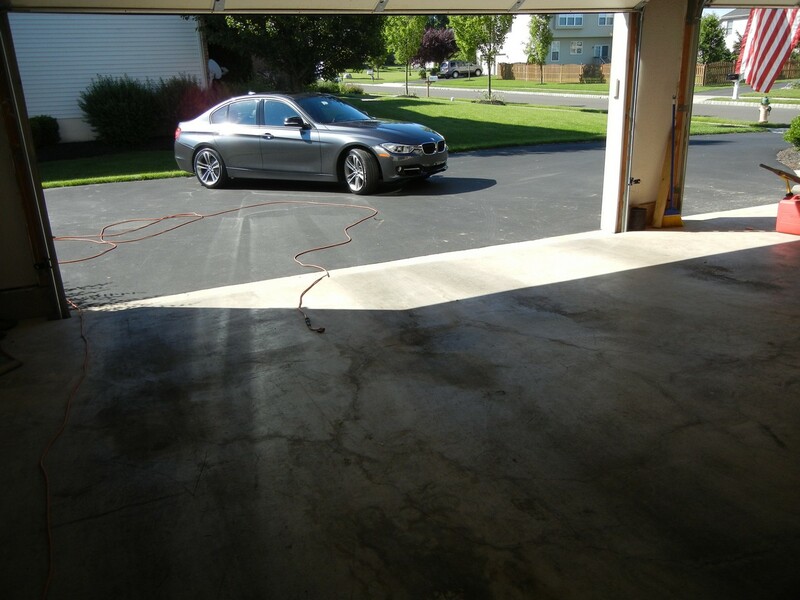 Then blow out the garage – perfect. 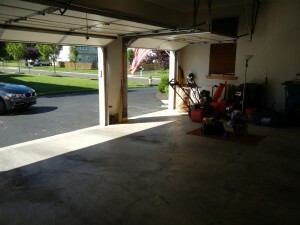 I’m lucky to have a 3-car garage. I live for 8 years with no garage at all – makes doing any work a nightmare. 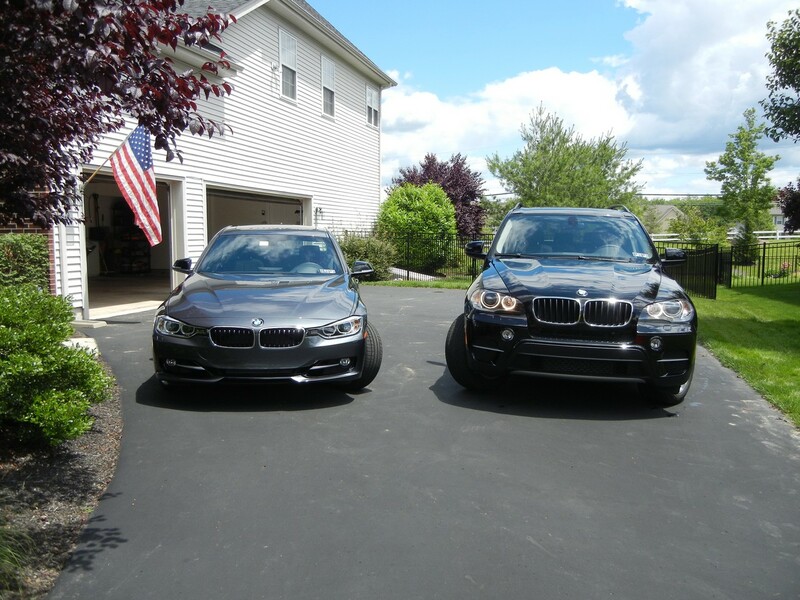 I’ll be washing and drying the car – today it is about 60F at 8AM – easy washing the 328i and not too bad for the black X5. You have to move quickly here because there is so much calcium in the water. You cannot let the water dry on the car. 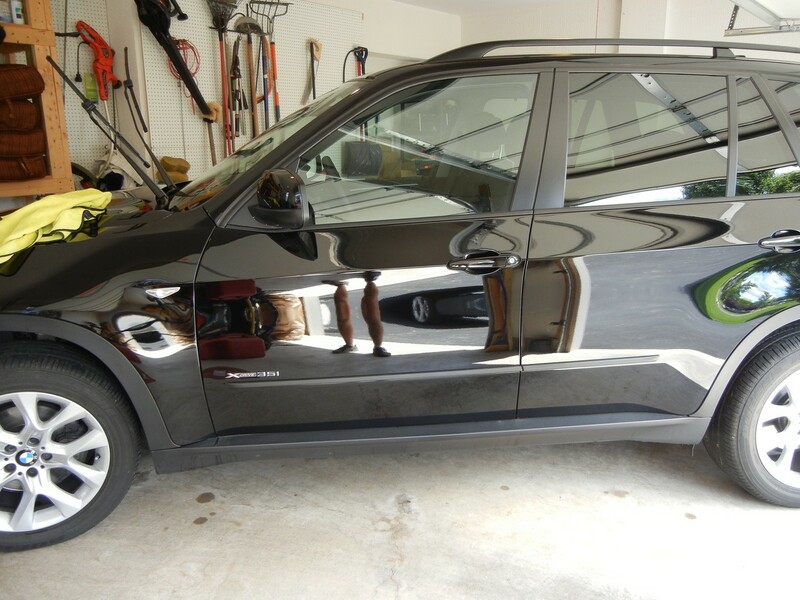 For the rest I’ll pull the car all the way into the garage so that the car is completely shaded – too hot outside for waxing with temps up near 75F by 10AM. 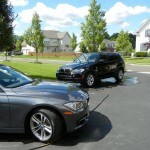 My 328i is new – I just washed it last weekend and waxed it only 3 weeks go. 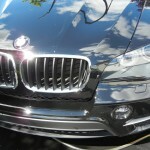 Most of the pics here will be of the X5 – a patient in serious, but stable condition. Check out the pics below. There’s regular dirt, bird crap, bug guts, strange gooey brown stuff, and more. 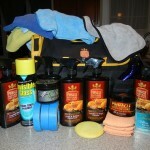 Pinnacle Bodywork Shampoo is what I use. 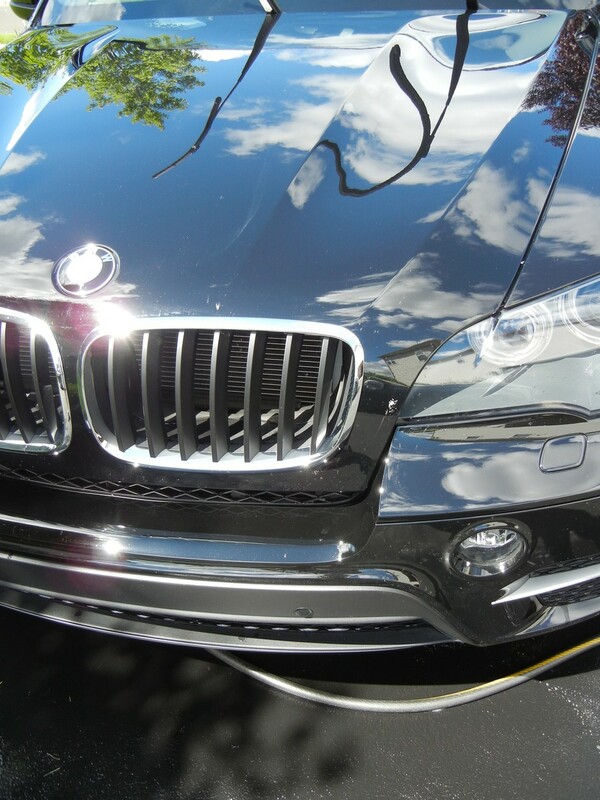 I have an unopened bottle of BMW wash, but I like the pinnacle stuff – you get great bubbles. Luthien gave me a new sheepskin mitt for my b-day so I’ll be using this. I prefer it over the poly mits. to me it is softer and it also hides the dirt better. For drying Cobra 530 towels rock – it will take 2 per car of the big size. I like this towel because you do not have to “rub” the car. Fold the towel in half and then simply flop it out and drag it across the panel. No water will be left. Not even a trace. There’s both car’s finished from the wash. You will notice the outstanding tire treatment on the 328i – that’s Meguiar’s Tire Gel. Looking pretty good. The big girl still has some serious issues. 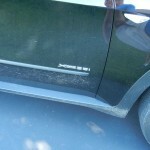 The wash did pretty good but the bug situation is nasty. 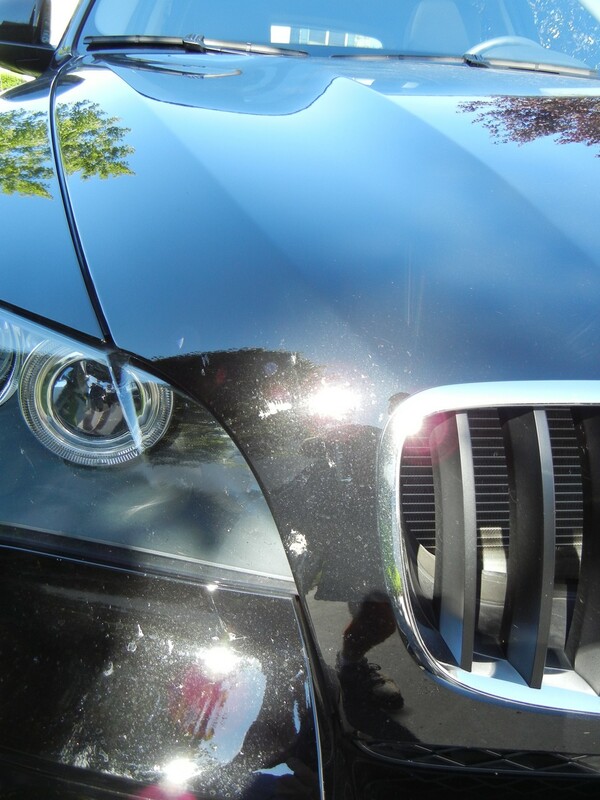 You can see there are still big gobs of goo and other stuff still on the hood after a serious and determined wash. Same is true all over the car. Time to get to work! The wash is the first step, but is really a prep for the main event. We’ve done what we could outside, everything else must be done in complete shade. 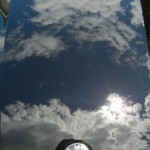 Can’t say this enough – tried for 8 years – don”t wax a car in the sun. If possible don’t wax one outside at all. 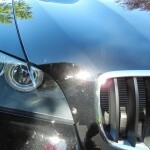 Dust, bugs, grass, and the sun – you will scratch your clear coat. You will see the swirls from all the crap that gets stuck in your wax. Don’t do it! Off the soapbox now. I’ve moved the car into the shade. 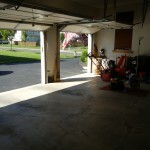 I’m lucky to now have a 3 car garage and can pull a car completely in. 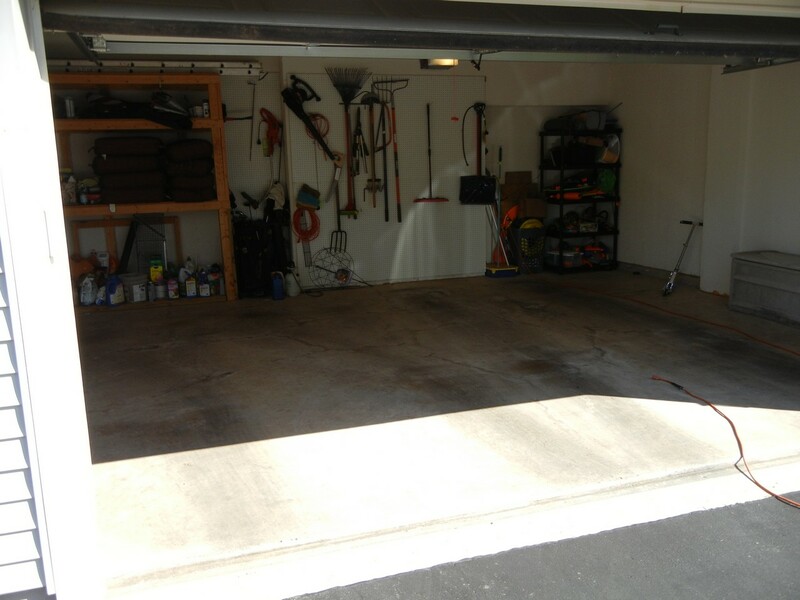 I lived for 8 years with no garage at all so this is a real luxury. Hold on a second now – feel the car. Is it hot? No waxing if the car is hot. You need to wait – while you are waiting you can wash the windows. We just washed the car, but the windows are special. 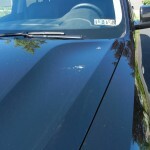 They need Invisible Glass – and on the outside the good stuff with the rain repellent similar to RainX. 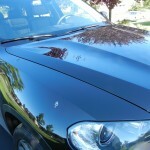 RainX is cool, but I find that when it starts to wear off it can make wiper blades chatter – Invisible Glass does not. 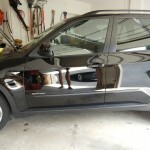 If the car is still hot – get out a swiffer, vacuum, etc. Once the car is cool you can break out the clay bar materials. 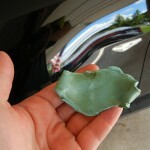 I’ve posted about this last year – clay bars are great at removing stuck on junk. 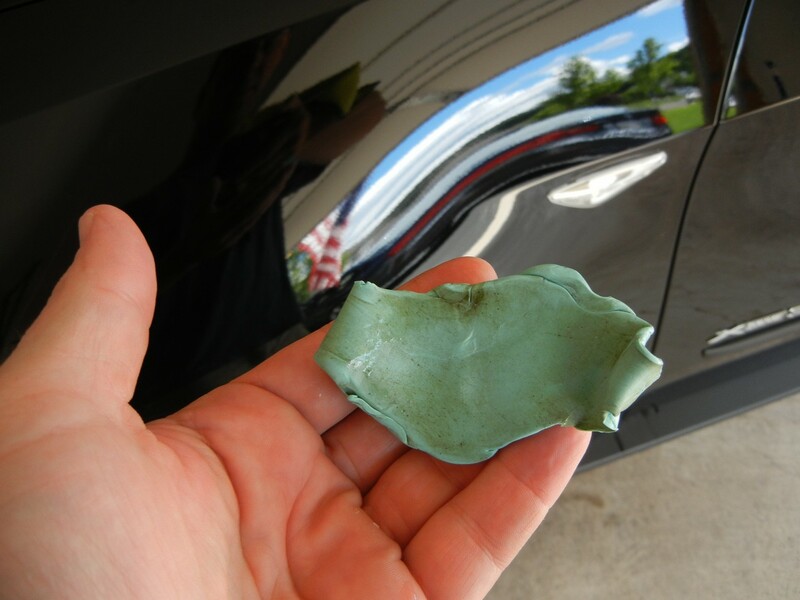 its a piece of sticky moldable clay used together with a lubricant – you spray the car with the lubricant and then gently float the clay with your hand over where you sprayed. You will feel the clay grabbing on stuck on stuff. You need to do this carefully and always use more lube when in doubt. Rubbing anything on your is dangerous. I’ll generally go through almost a full bottle of lubricant per car. 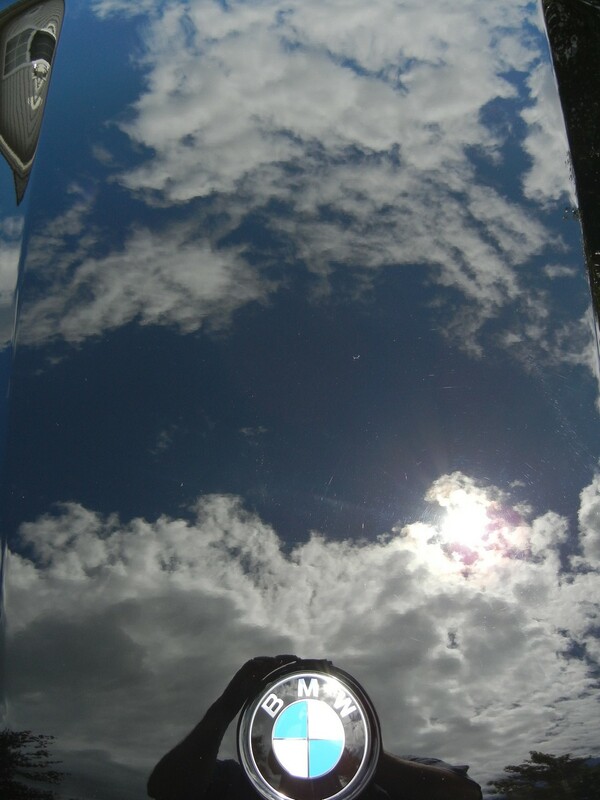 I use Pinnacle Clay Bar lubricant, although Meguiar’s Quick Detail is ok too. The pics above show the process and products. when the clay gets dirty you need to fold it over – mush it around like silly putty. When it gets too dirty – chuck it and get a new piece. That piece was from the hood! imagine the lower panels. Wow! What’s too dirty? No clue…I err on the side of caution and chuck it if I think its too dirty. You can see the result in the two pics on the right above. The front-end is considerably cleaner than the post wash pictures. There’s still some goo however! 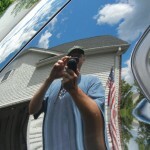 I’ll use Meguiar’s Cleaner Wax and Pinnacle’s Bodywork Lotion to rid these final pests. If you are a regular here you know that I’m a big fan of Pinnacle Souveran. 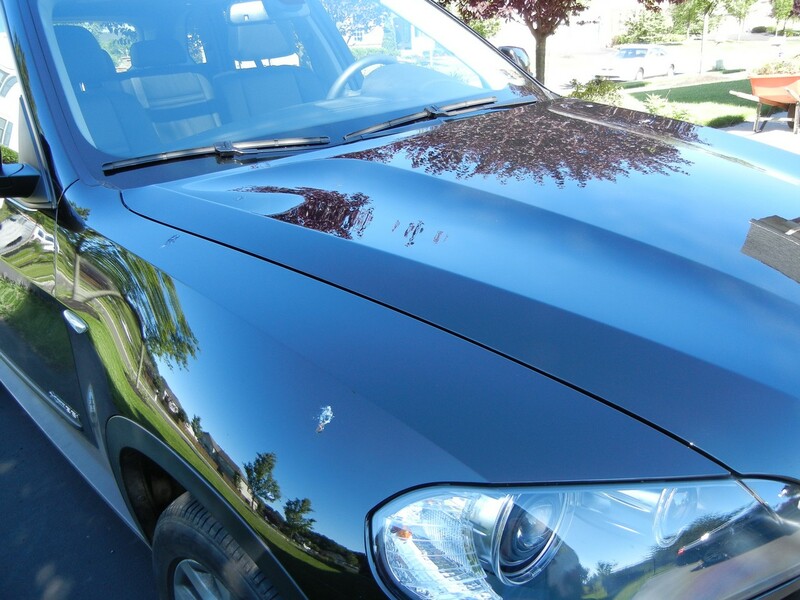 This is a great product – made in the USA – goes on smooth, comes off easy, it lasts pretty well, and on dark cars it builds a deep shine. 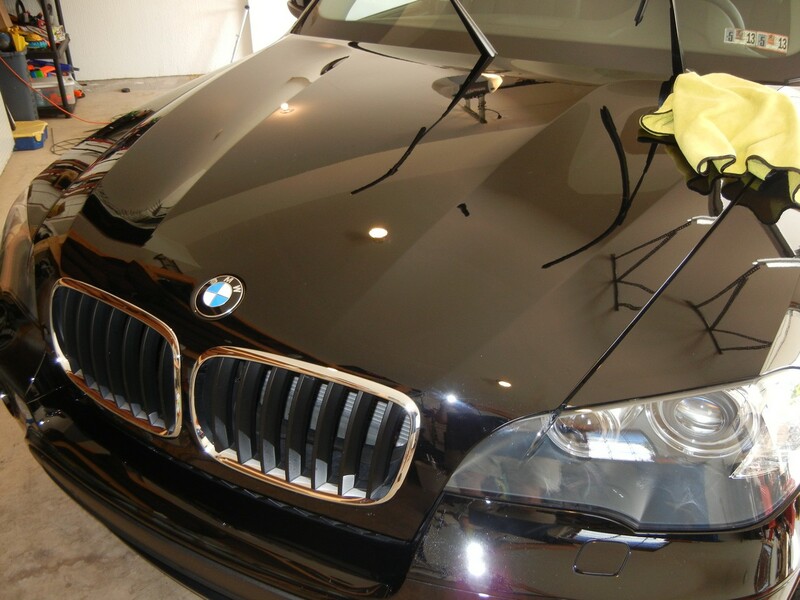 Check out that wax – most carnauba waxes are yellowish. 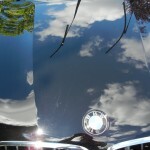 This one is almost white – and that means a better shine. (It is more white than it looks in the pic.) I use a regular foam applicator. 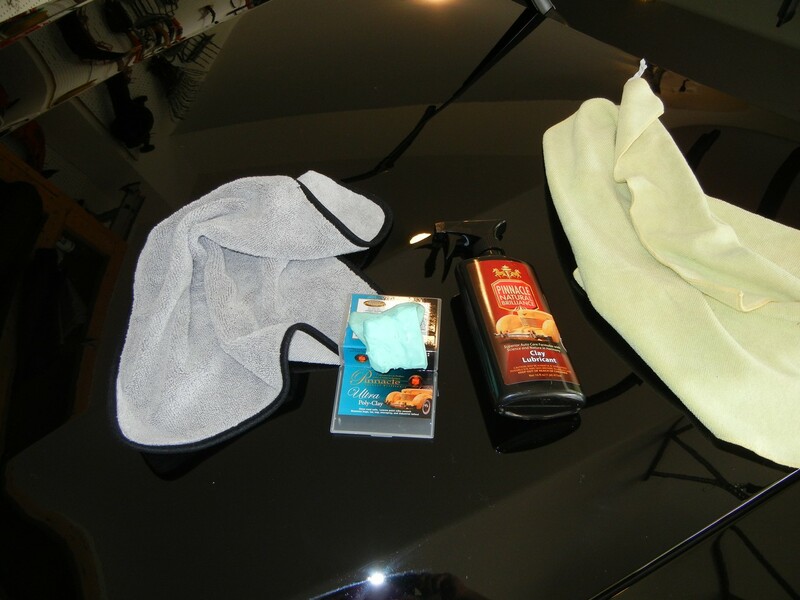 To remove wax I use about 4 low pile cloths and then follow up with a deep pile buff cloth, the grey and red one in this pic from Cobra. The final preparation – kind of like the surgeon marking the cut lines on the patient is taping off plastic. Insane? No – definitely not. Do you want to see silly white crap coming out in 3-4 weeks? No – PITA. 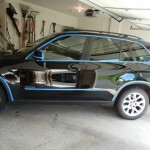 Tape the car – use painter’s tape from 3M and don’t go “cheap”. 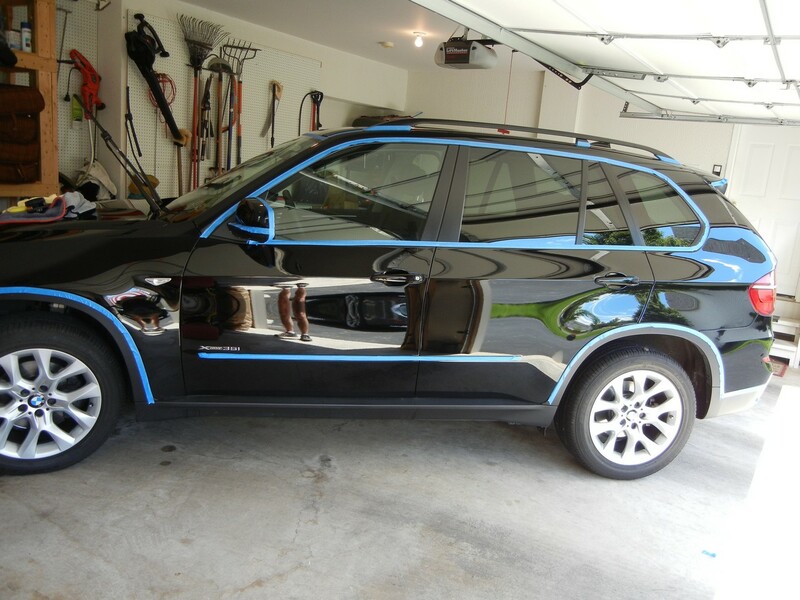 I mask off all rubber and plastic – which on this car is a lot of taping since the front and back bumpers, the wheel wells, and all sorts of stuff have it. Its worth it. I used 1 $2.75 roll. 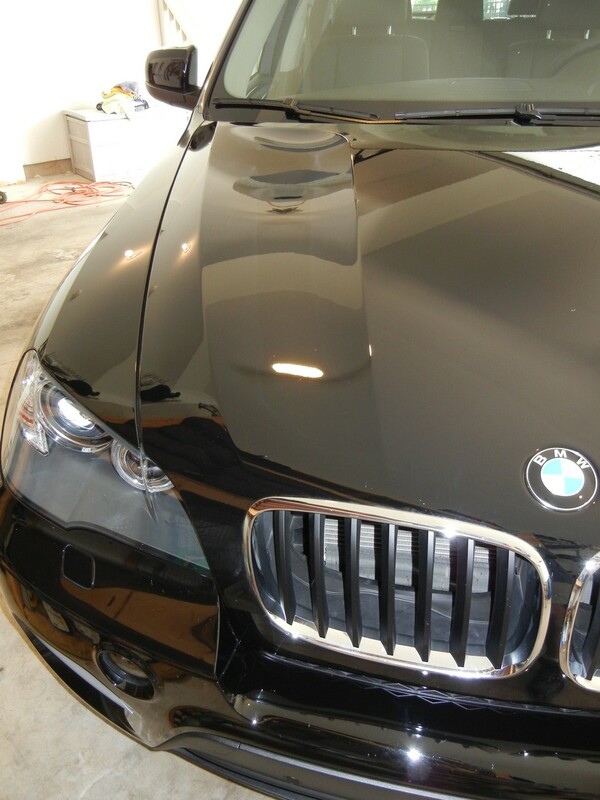 To remove wax on plastic you would need to either use a decent vodka or some other goofy crap that will cost more. 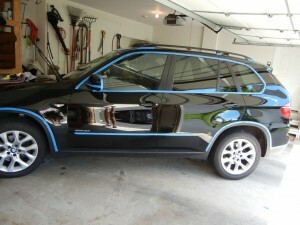 Tape the car! With that done the waxing can proceed. 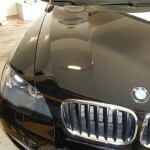 Small sections, top to bottom, wax-on/wax-off. 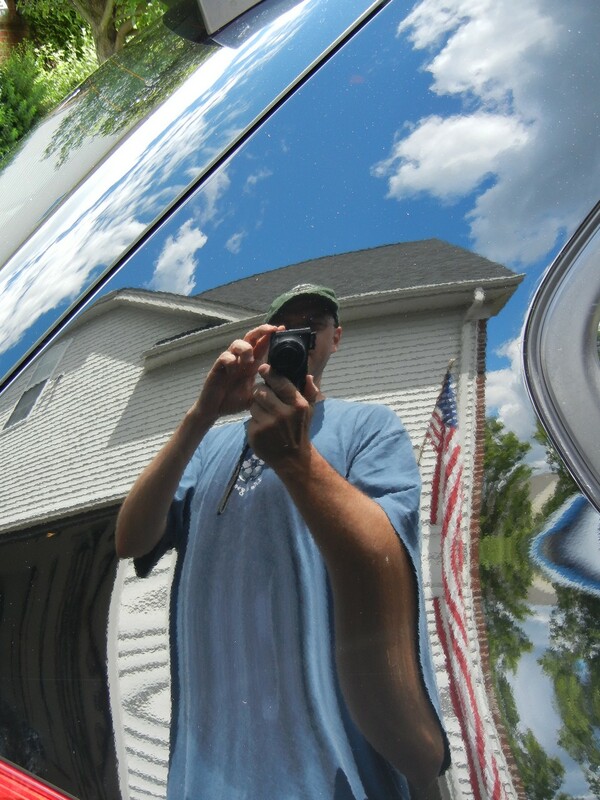 I walked around the car and did spot treatment with Meguiar’s Cleaner Wax to try and get rid of anything left on the car. Didn’t really work that well. So what’s the result of all this? See the pics below. Pretty decent I think although I think there’s still crap that did not get removed properly. I guess I will also reiterate that any substance, including oxygen and other molecules, will cause micro abrasions on the surface of your vehicle. Ask the Shpinx 🙂 If you get an answer from him, call a doctor. Next story Appcelerator Titanium Studio – Mobile Development Made Easy?